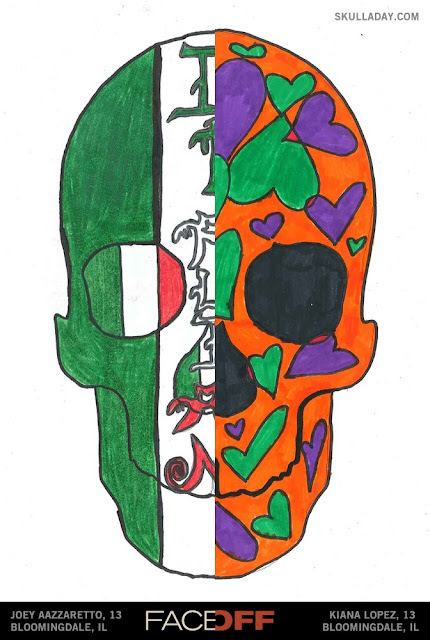 Micaela Schiavo of Italy is having fun making this vegetarian skull from a carrot. My Mom always told me that eating carrots is good for my eyesight so it strikes me as comical that this bug eyed fellow can probably see his ultimate demise. Yet, he still keeps a grin on his face. Thanks for sharing this smile with us, Micaela! 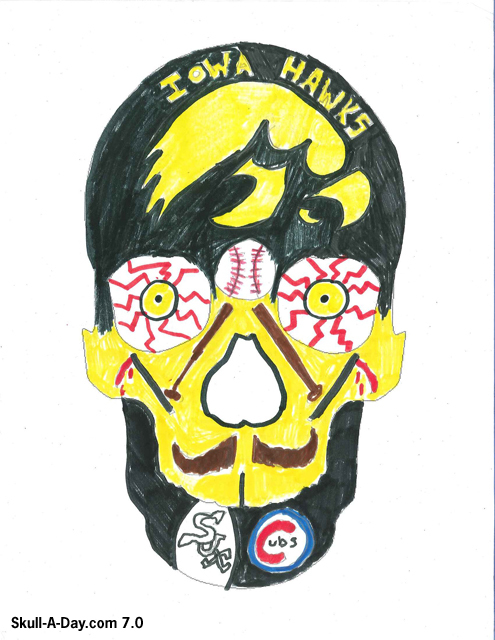 As a part of our celebration for Skull Appreciation Day we're presenting you with the "Fan Submissions" part of our Face Off exhibit. We asked our readers to submit their own skulls using the template that was provided then we faced them off against each other, and we now proudly present for your viewing pleasure, the final results. 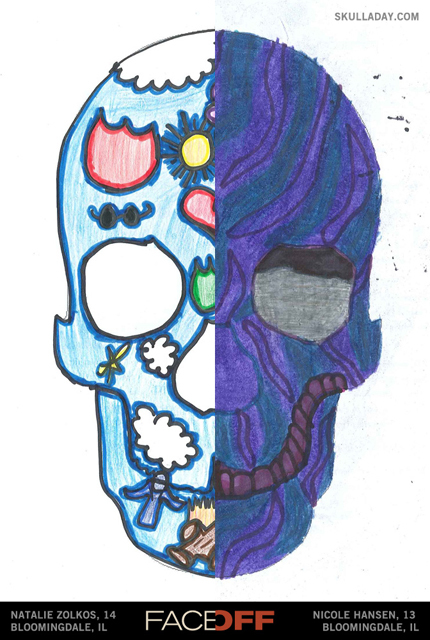 This Face Off mashup contains two submissions from students at Westfield Middle School, in Bloomingdale, IL. 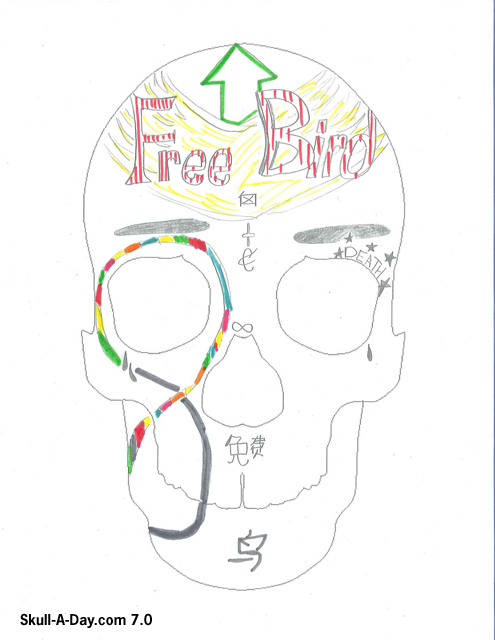 The students did these in their art class taught by Deyana Matt. 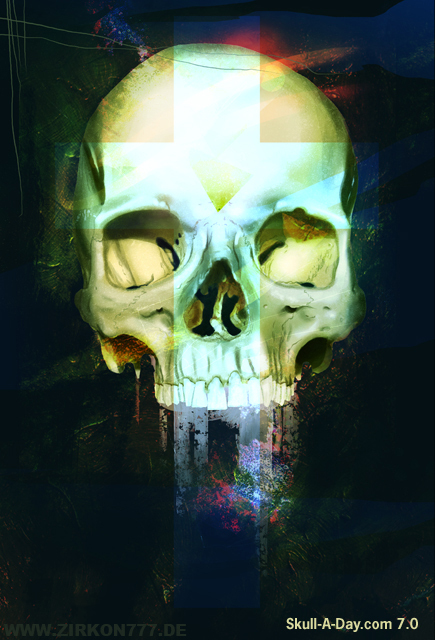 Bart DeKeyzer created this skull and image to remind us that hindsight is 20/20, as long as we have eyes to see that. Okay, maybe that wasn't Bart's message in all of this, but I thought it sounded pretty good. It's always clearer at the end when you can reflect and hopefully learn from what you just experienced. If you would like to see this as a daily reminder then check this out. 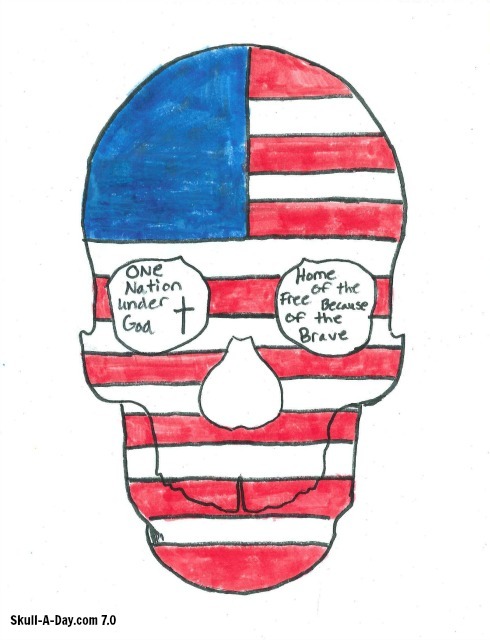 Thanks for sharing your skull's message with us, Bart! 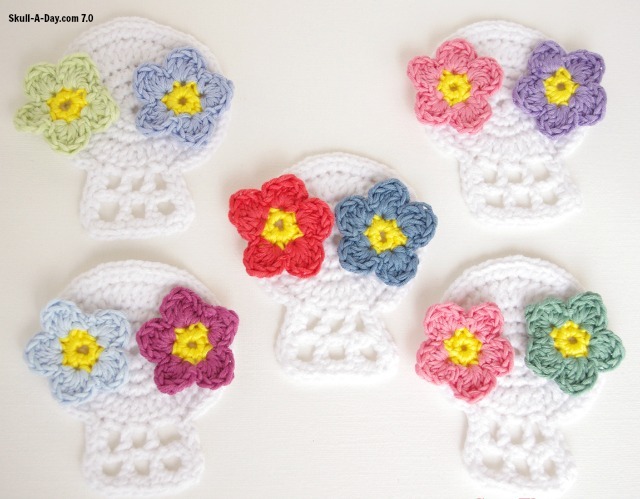 Coco Flowers, from Paris, France, created these crocheted skulls and flowers. 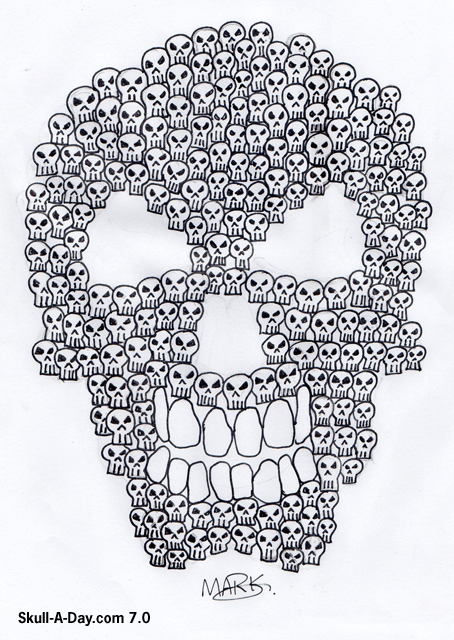 I grabbed this animation from her blog, because the skulls look like they're dancing. I've been talking about crochet a lot recently, with various crocheters. 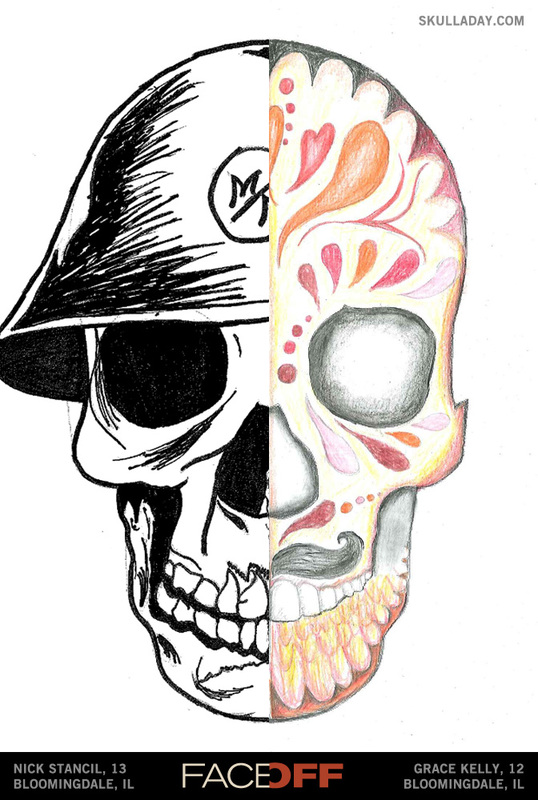 It's probably because Fall is soon, and I'm pondering new designs...mostly a skull design. Seeing great crocheted skulls like these, really is fantastic inspiration. I love the use of flowers as the eyes. This could help solve a design issue I've been having. Check out Coco Dollz Shop to purchase her creations. This week's simulacra were found on the ground. Danette Pratt works with Marie Graham at Ohio University. Danette explained that "Marie routinely walks her creek beds and washes on her property here in southeastern Ohio. Then she brings her finds into the office to show and tell...usually flint arrow heads and spear points, interesting rocks and tumbled glass pieces." 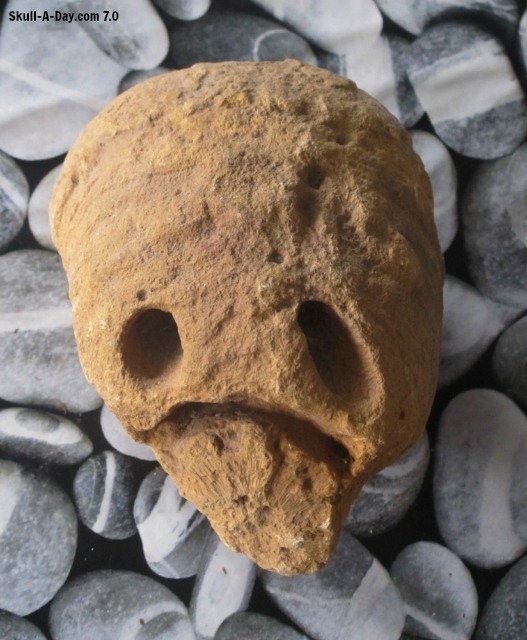 In June Marie brought in this "pebble skull", and granted Danette permission to photograph it and submit it us. Tamela Nagy found this skull shell on Grandview Beach, in Carlsbad, CA. 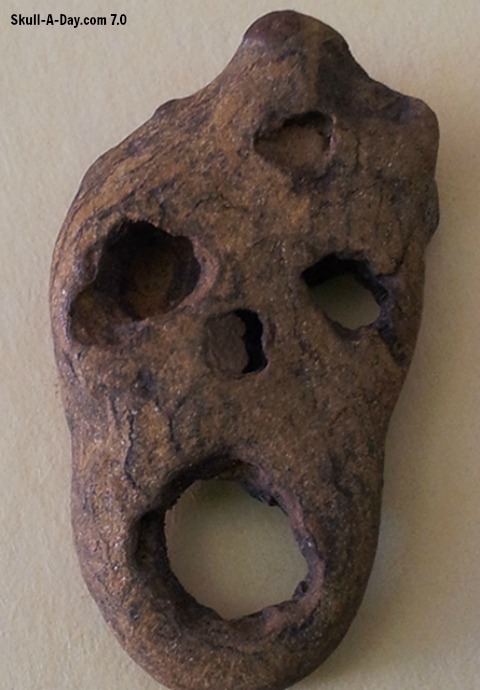 Denis Fontaine received this skull rock from a friend. They found it in their yard. Neil McIrvine of Melbourne, Australia created this skull from the airbrush paint bottles he used to create this airbrushed skull painting. 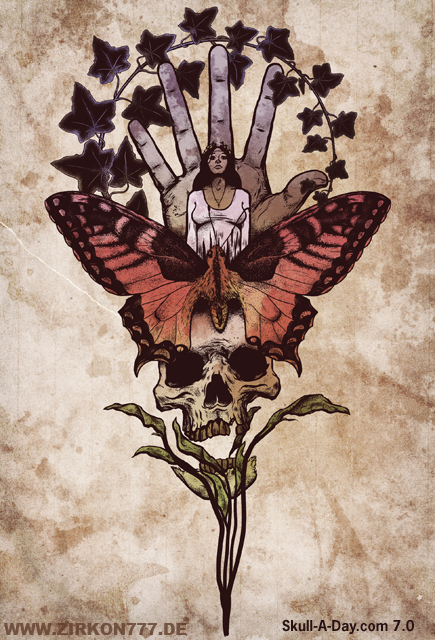 Neil also submitted this to a competition for Createx Paints so we'll wish him the best of luck with that. The painting is truly beautiful and I'm sure it will garner a lot of attention. Thanks for sharing it with us as well, Neil! 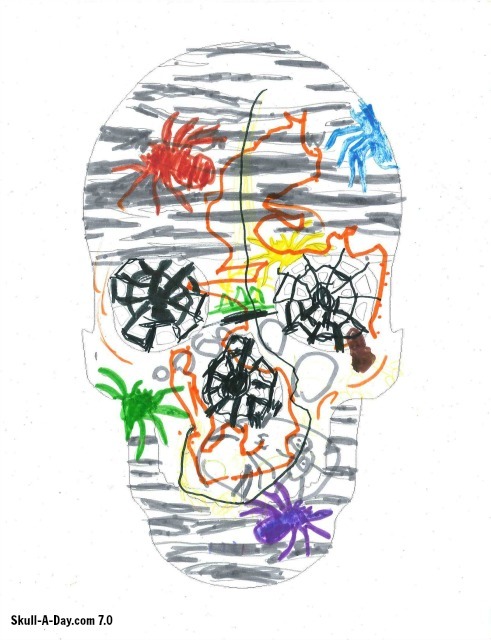 As a part of our celebration for Skull Appreciation Day we're presenting you with the "Fan Submissions" part of our Face Off exhibit. 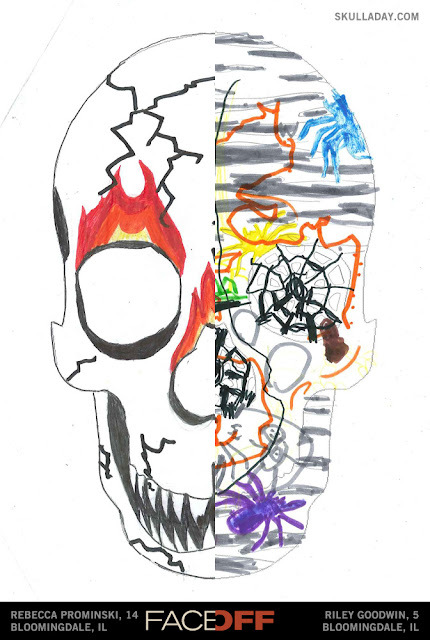 We asked our readers to submit their own skulls using the template that was provided, then we faced them off against each other, and we now proudly present for your viewing pleasure, the final results. 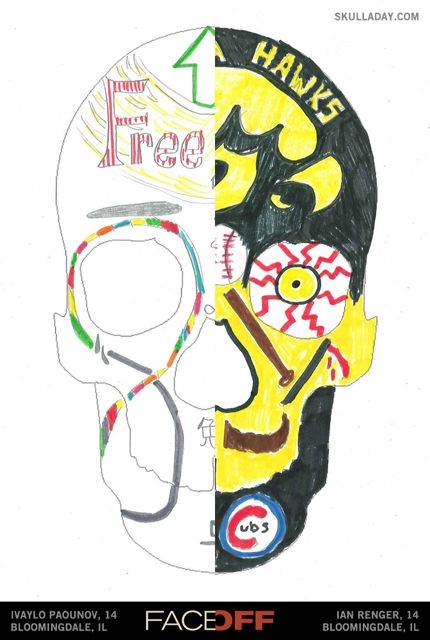 This Face Off mashup contains two submissions from Westfield Middle School, in Bloomingdale, IL. The students did these in their art class taught by Deyana Matt. This skull is by Rebecca Prominski. 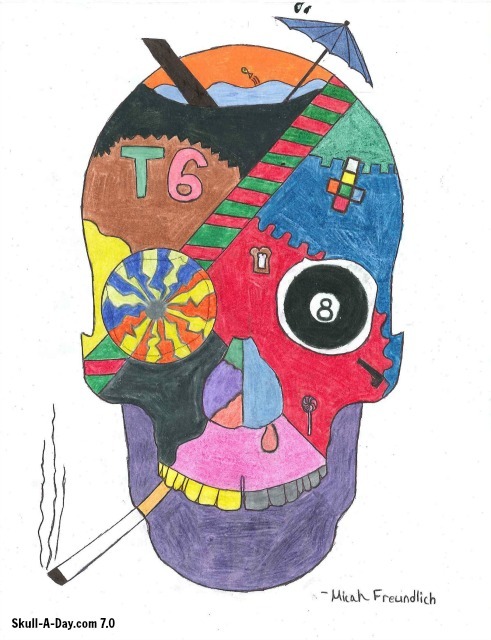 This skull is by Riley Goodwin. 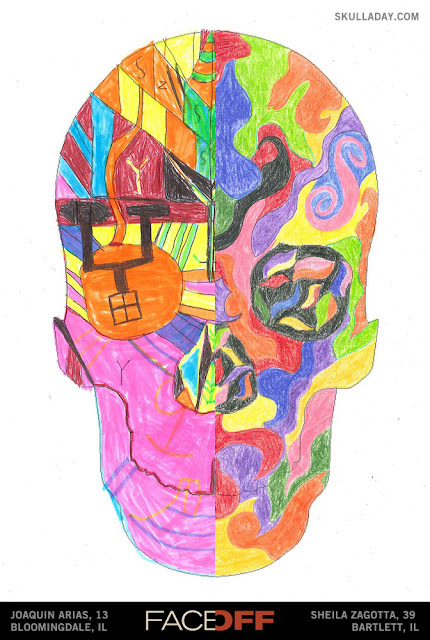 This skull is by Nick Stancil. 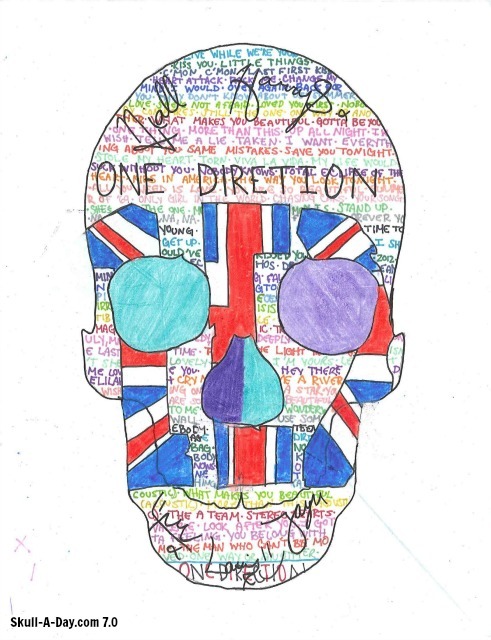 This skull is by Grace Kelly. 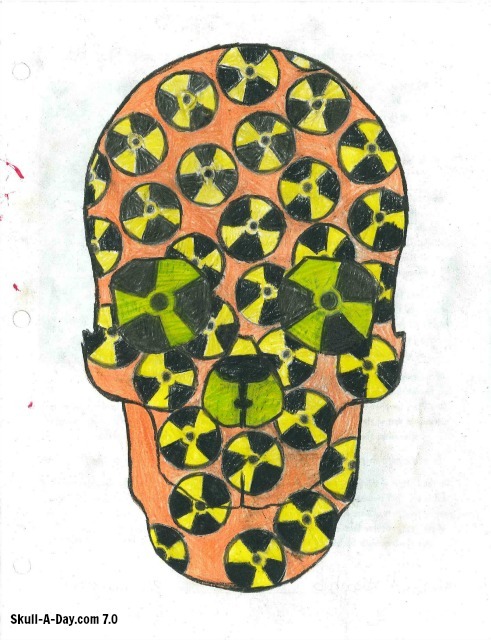 Today's "Skull of Skulls" is from Mark Taylor of Luton, UK. 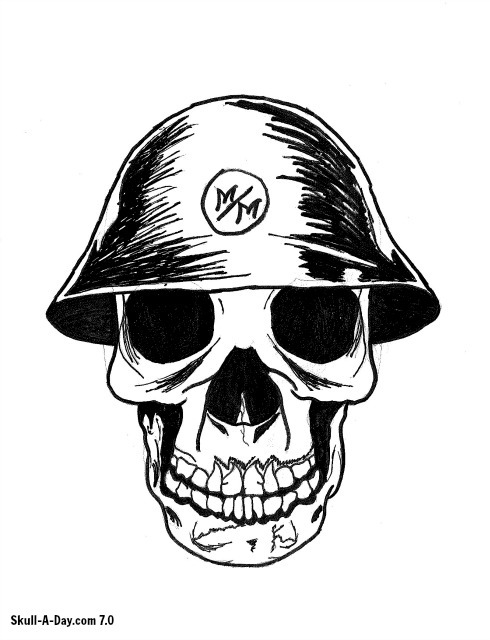 A time consuming doodle that's strangely reminiscent of another skull of skulls I've seen before. Thanks for sharing yours with us, Mark! 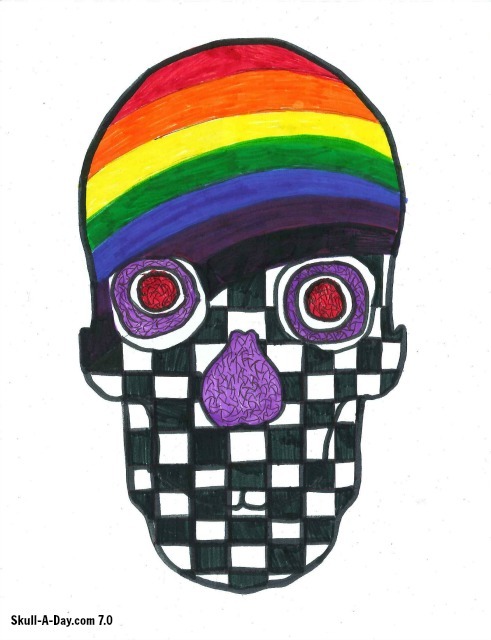 This skull is by Micah Freundlich. 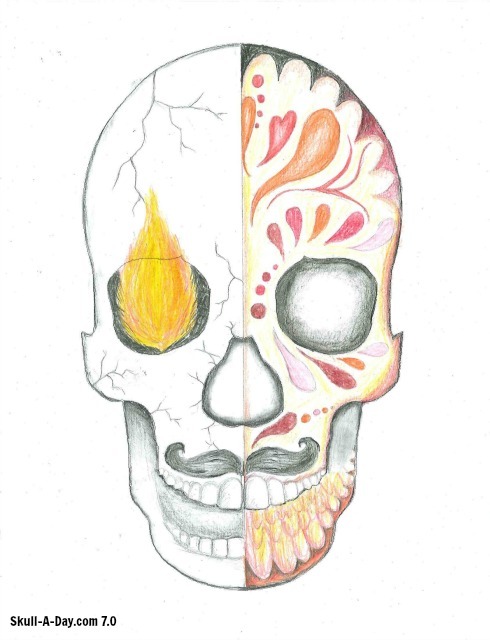 This skull is by Sania Kohli. 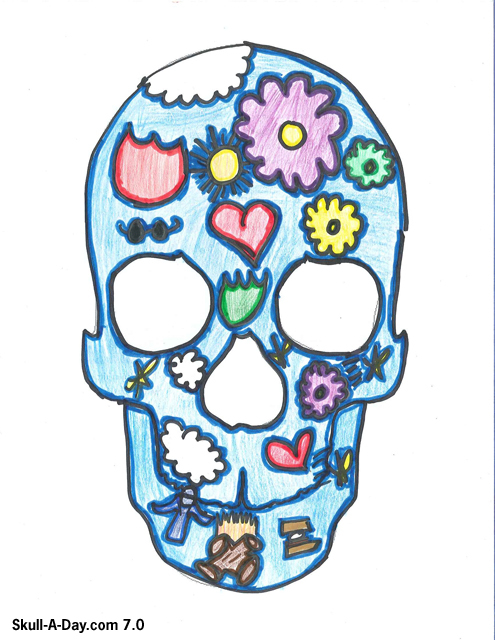 Today's skulls were found while looking up. 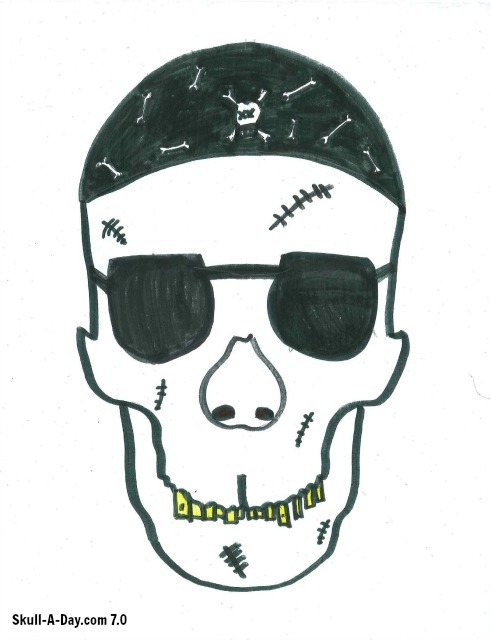 Randy Latini from Somerdale, NJ found this skull formed from tree leaves and the sky. 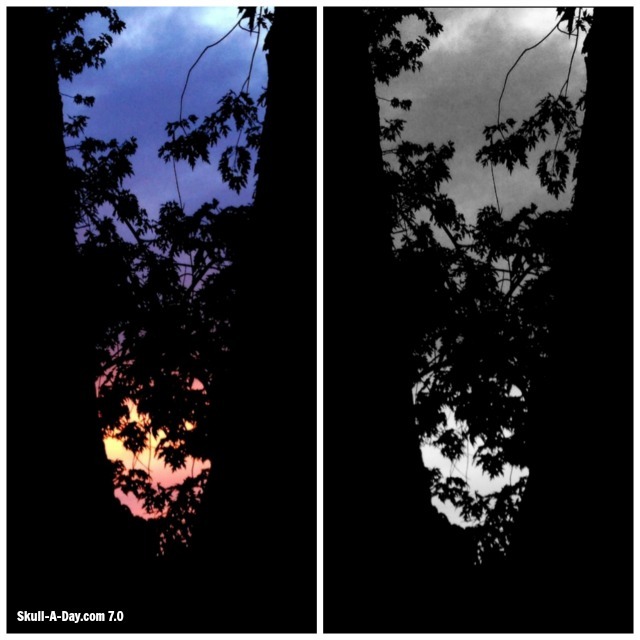 I included both versions, so you can see the full skull effect of the leaves against the sky. 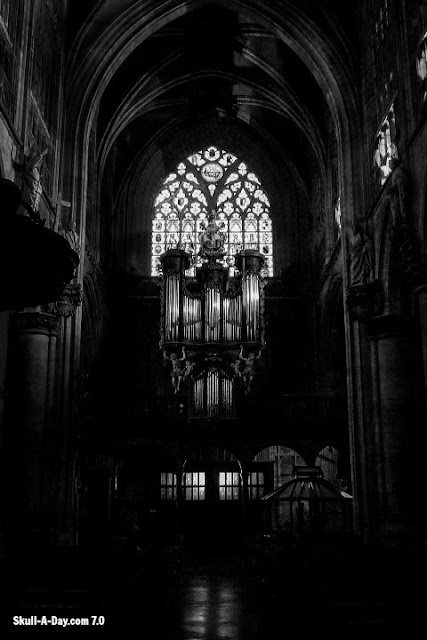 Vitor Costa of Hallandale, FL said "This Photo was taken inside of a church during a trip to Brussels, Belgium at 6:45PM , March, 07 2011. Me and a couple of friends had been walking all day and just wondered in to take a look, I did not get the name of the church, and just realized that the organ looked like a skull after I got back from the trip." If you have trouble seeing the above skull, try looking at it smaller. 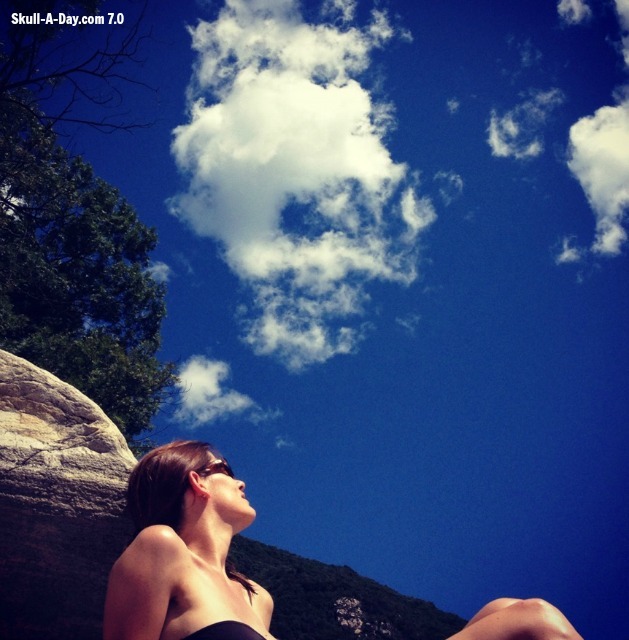 Louise from Zurich, Switzerland found this skull in the clouds. Andreas Ivanof AKA zirkon777 brought us this skulltoon way back in Skull-A-Day 2.0 (2008) and figured it was time to update our archives with some wicked new designs. Such a great collection of different styles. 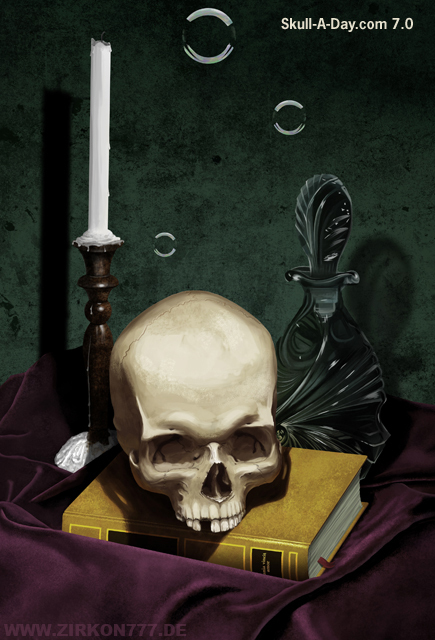 The first has a 3D effect that makes it come "alive", the second reminds me of some great album cover artwork for some "stoner rock" bands, and the third looks like a classy, sophisticated piece of art worthy of any castle library. I'm digging on all 3 of them, Andreas. Thanks for sharing! THIS CONTEST IS CLOSED! Thank you for participating! Don't forget you have until 11:59pm Eastern USA Time Friday, July, 19, 2013, to enter the the current giveaway. Everything Tiny is giving away a Tinysaur Hominosaur (human skeleton) model and four alternate heads. You can find the original contest post by clicking the side bar ad, or this link. 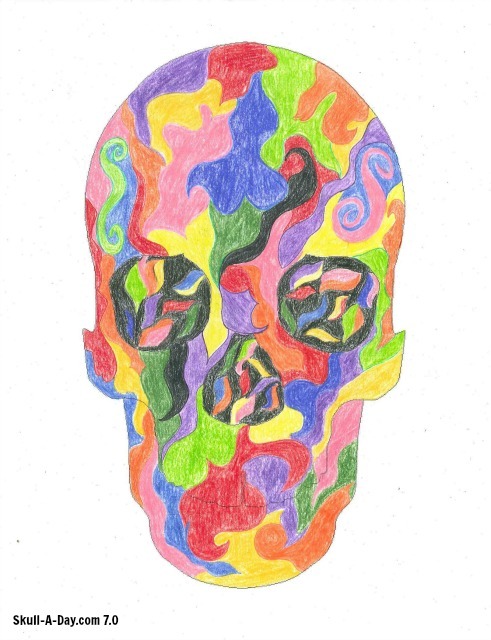 This skull is by Kristian Balli. 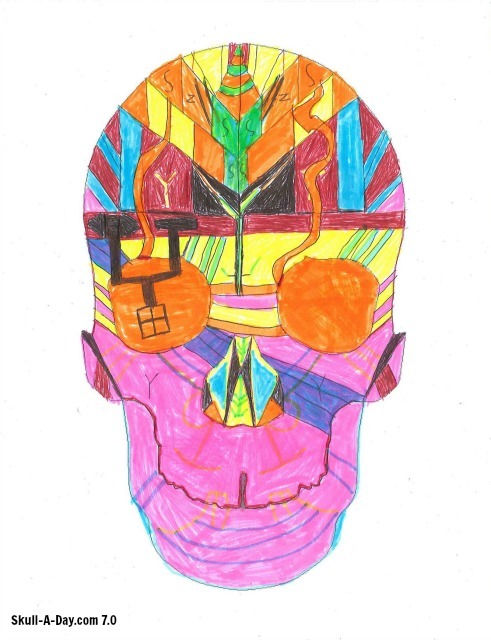 This skull is by Matthew Tumbarello. 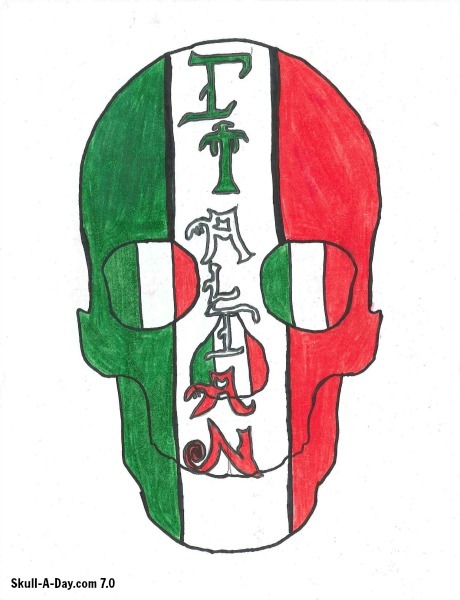 This skull is by Joey Aazzaretto. 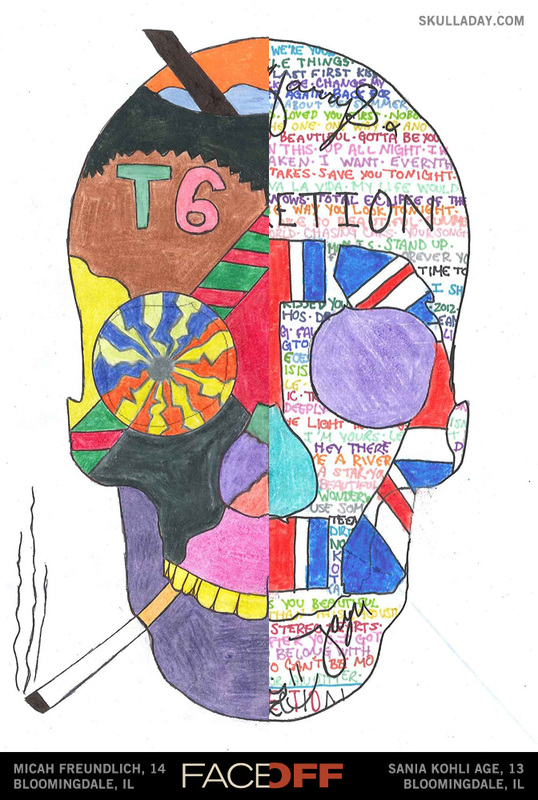 This skull is by Kiana Lopez. This skull is by Joaquin Arias. 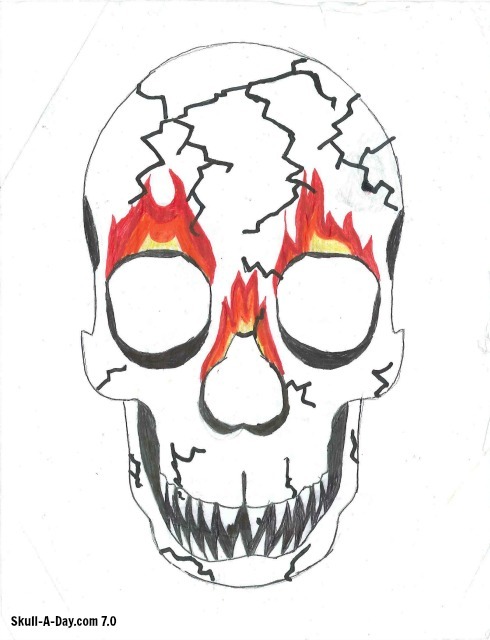 This skull is by Shelia Zagotta. Put a kettle on and brew up some tea, it's time to share a sip with Liz Hoge from Las Vegas, NV. 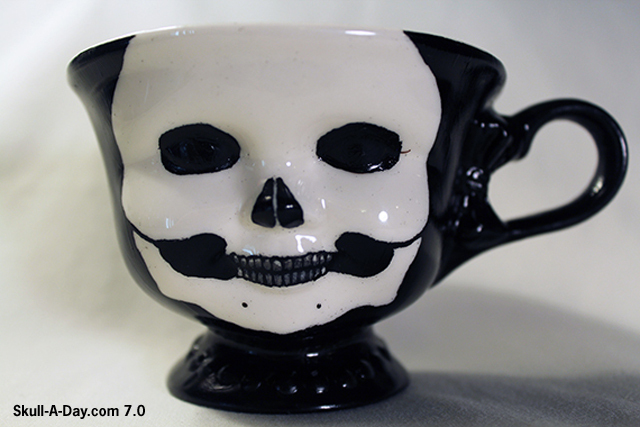 This doll's head tea cup is über cool now with a face lift off. 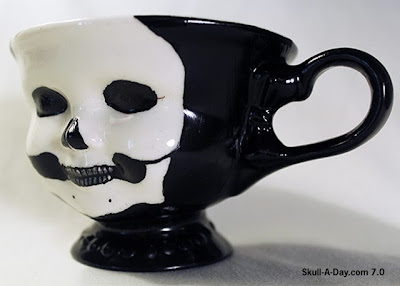 Liz hand paints a lot of different corpse cups, but of course this one is our favorite. This would be a perfect vessel for delivering a black magic potion, but maybe a little obvious. Thanks for sharing a cup with us, Liz! We know you all love skeletons, but what about tiny skeleton models? 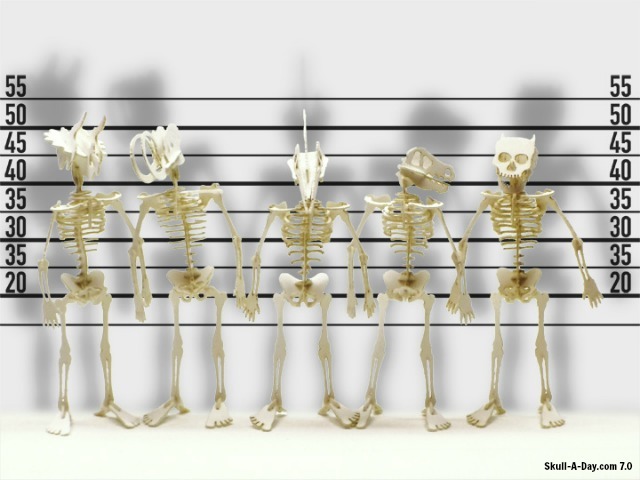 Everything Tiny has created a line of tiny skeleton models called Tinysaurs, including dinosaurs, a woolly mammoth, a butterfly, a hominosaur (tiny human). Their newest Tinysaur, the Hominosaur, is being launched through Kickstarter. To share the skeleton love, they are giving away one Hominosaur with a Four Alternate Heads kit. What the Hominosaur looks like with the various heads. PRIZE INFO: One Hominosaur (human skeleton) with a Four Alternate Heads kit. The alternate heads are: T-Rex, Woolly Mammoth, Pterodactyl, Triceratops, and a bonus devil horn add-on for the stock human skull. A tiny human skeleton kit assembles into a 2" tall hominosaur. Tinysaur Kits assemble into tiny dinosaurs from a postage stamp sized laser cut pattern. Assembly generally takes 20-30 minutes. HOW TO ENTER: Since Tinysaur makes a variety of skeleton models, to enter this contest, comment below with an answer to this question. 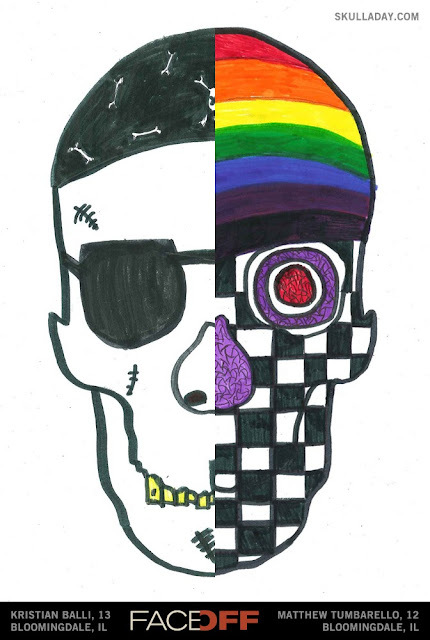 What is your favorite skeleton(s) to see? For example, I love seeing pterodactyls and bats. I'm fascinated with their wings. 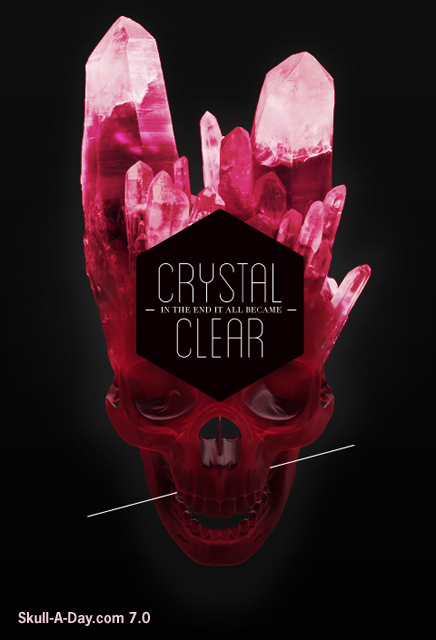 CONTEST CLOSES: 11:59:59 PM Eastern USA Time Friday, July 19, 2013. IF YOU DON'T WIN: Don't fret, Everything Tiny has several of their Tinysaur skeletons available for purchase in their shop. 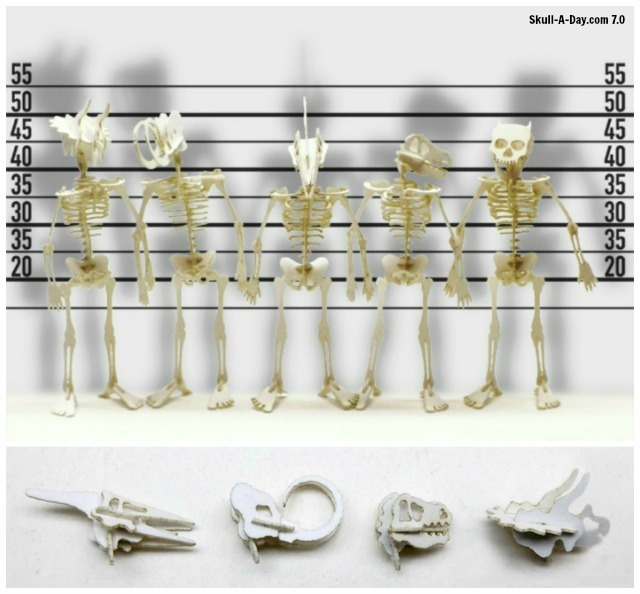 To get one of the Hominosaur (human skeleton), support the Kickstarter! There are several neat things you can get for different pledge amounts. Follow them on Facebook to keep up with Tinysaur creations! 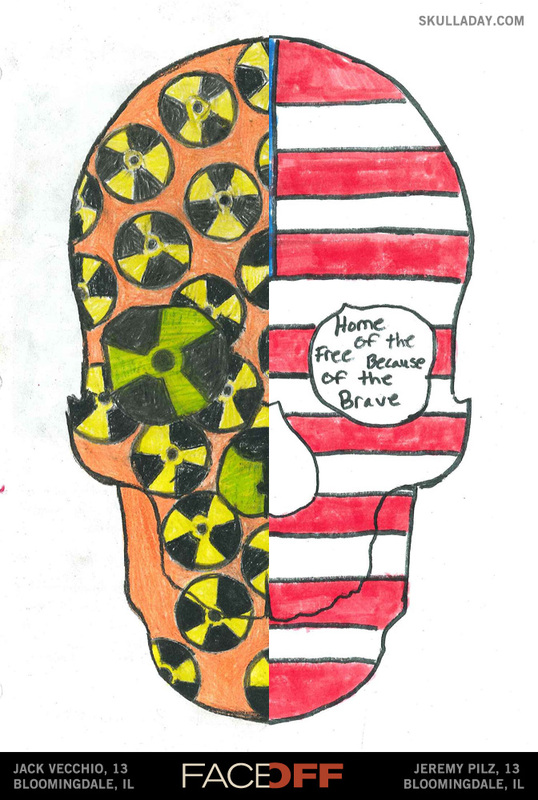 This one is by Jack Veechio, age 13. This one is by Jeremy Pilz, age 13. These skulls were formed from bubbles. Amy Dietz of Richmond, Virginia, explained, "The foam from my beer formed this skull! I had to quickly take the picture before it dissolved away. It only lasted about 15-20 seconds. Pure luck!" 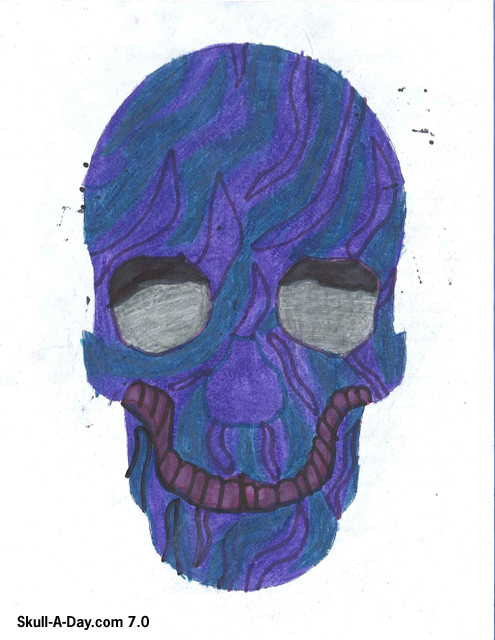 In April, Giuseppe Zappalà of Torino, Italy, "found this bubble skull in a bottle with photographic development chemical" he uses! 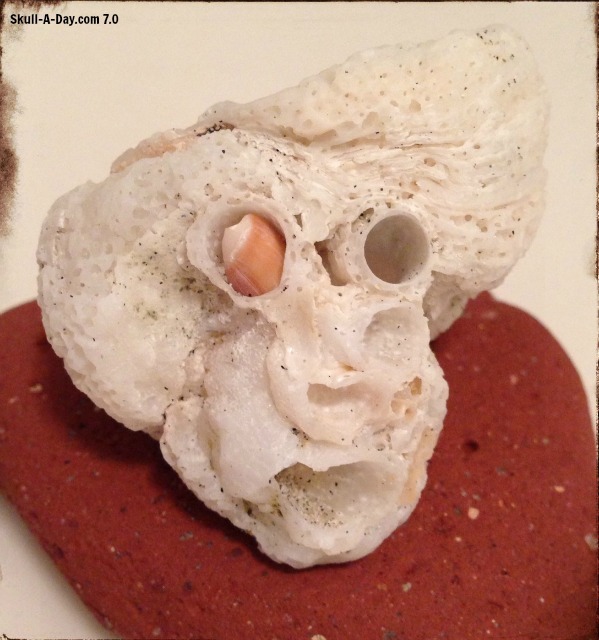 David Naugle found this skull in ocean foam. He took this Vine video of the skull and it blowing away.